Who doesn't want to look and feel 10 years younger? 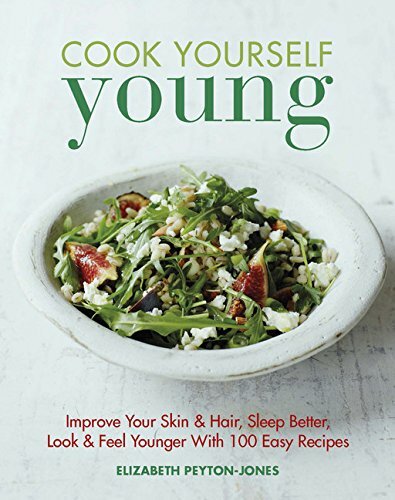 With this book, you can forget Botox, chemical peels, and the surgeon's knife and Cook Yourself Young, with more than 100 easy-to-cook dishes that use the natural medicines in foods. Many of the recipes are vegan or raw, without wheat, dairy, or gluten. Fully illustrated with color photographs and packed with tips for tackling problems including digestive issues, bad skin, and fatigue, Elizabeth's food boosts the immune system, making you look lean, healthy, and vibrant. Elizabeth Peyton-Jones is an herbalist, naturopath, and food and health consultant who helps people make diet and lifestyle changes to rejuvenate their health, looks, and wellbeing. Her philosophy is to slow down the ageing process through a way of eating that helps us look and feel more youthful. Elizabeth runs a highly successful alternative health clinic in Kensington, London for clients including models, actors, celebrities, and other public figures. She designs nutritious bespoke menus and juices for clients such as the InterContinental Hotels Group, Four Seasons Hotels, and British Airways.